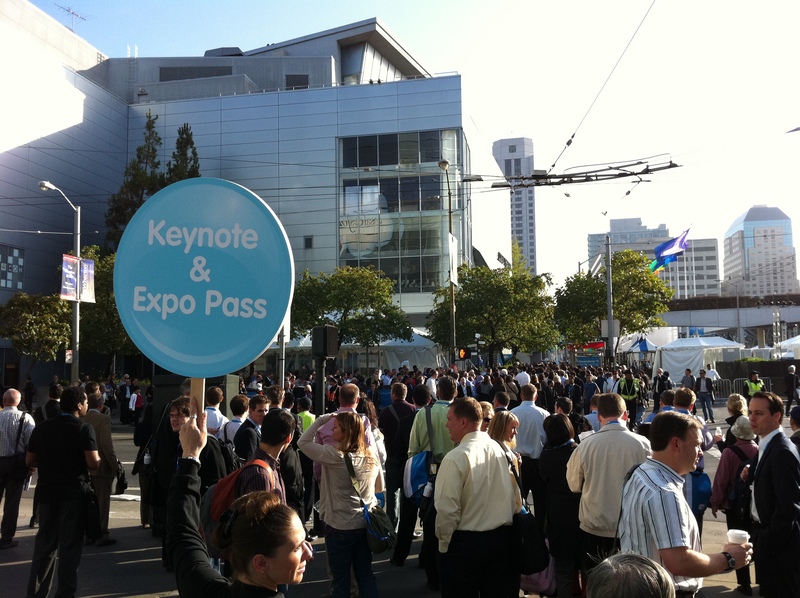 I’m here at Dreamforce 11 right now in Moscone Center in San Francisco. Salesforce made major announcements last night about Chatter, their social business platform, that is now more Internet facing. I once called Chatter an enterprise social operating system and these announcements make it even more true now. Expect that this will significantly improve their positioning in customer engagement as their CRM tool is probably the top product in the space. The move connects their core strengths to social computing even better than Chatter did before, while putting them into the Social CRM business in a significant way. The new Chatter now has customer groups and social analytics features and more. Larry Dignan did a good round-up of the changes and additions this morning on ZDNet. It’s very clear with the prominent focus on social business this morning that Salesforce definitely wants to be seen as the social enterprise leader. They’re working very hard to position themselves as such. The confab certainly confirms no small level of market enthusiasm: There are huge crowds in the streets and tens of thousands of folks here. Though sales automation was Salesforce’s original focus, they are very much moving to become a full spectrum social business enabler. It’s a story all social business practitioners should follow closely and this is a pretty major series of announcements, not just for the products but because the messaging will be heard far and wide in boardrooms and the C-suite. You can watch it live here and I’ll do some real-time analysis here, so refresh as often as you like. Note: If it’s in quotes, it’s very close to exact wording, otherwise it’s a paraphrasing of the speaker. 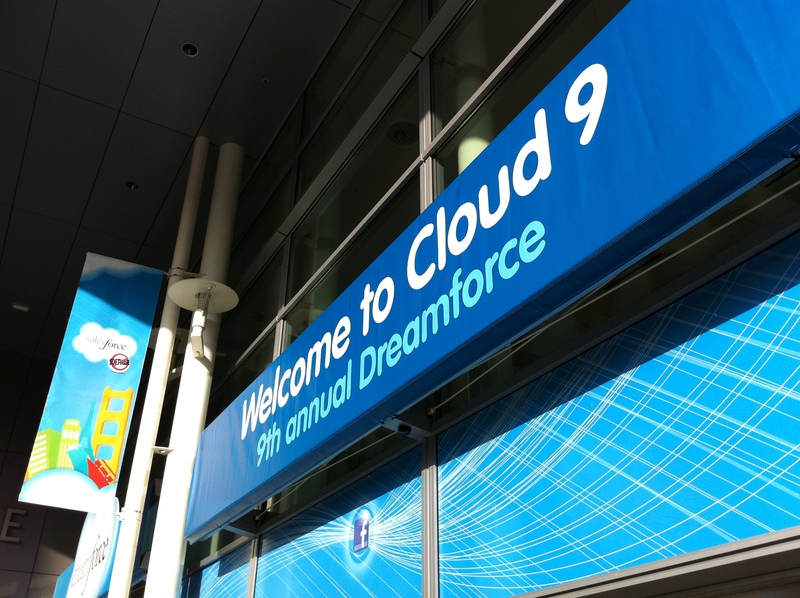 9:03 – The keynote is about to start with Marc Benioff on stage shortly. 9:11 – Still hasn’t started yet but they announced it will shortly. 9:14 – Salesforce’s Peter Coffee is announcing a Hawaiian themed opening ceremony, saying Marc Benioff has great appreciation for the state and its culture. 9:19 – Music montage, Benioff is not on stage yet. 9:23 – Benioff is up: “You are now part of the largest technology industry event.” Says 45,000 people in attendance and 35,000 people online. 9:24 – “Salesforce.com was born cloud and have now been born social.” “We want to delight our customers with something new. We’ll look at how Salesforce is helping organizations become more social.” Mentioning Twitter’s #df11 hashtag to follow everything. 9:26 – Talking about the transition from mainframe, to client-server, to cloud. Multi-tenant vision of shared services. Talking about their new philanthropic model. Took 1% of equity, profit, and employee time and put it into a 501(3c). 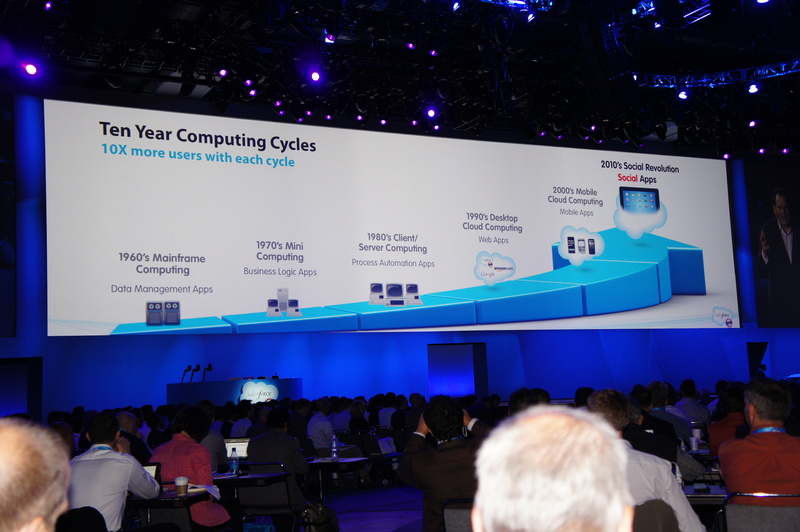 9:28 – Talking about the evolution of computing, from mainframe, to mini, client/server, Desktop/Cloud computing. Mentions Steve Jobs, everybody claps. “Entering new era, an exciting new era”. Not thanking IBM, not thanking big companies, we’re thanking Facebook that’s creating change and transformation, an “Arab Spring” in business. 9:32 – When will we hear a “corporate spring”, when customers rise up and demand that organizations listen? That’s the social revolution that’s coming. E-mail has eclipsed social networking users. Look at how Facebook is eating the Web. Now it’s all about Facebook.com/yourcompany, your company, your project, etc. 9:33 – It’s not just about social, it’s about mobile. Mobile apps are used now more than Web browsers. Tablets and smartphones are taking over. 9:35 – It’s not just about consumers, it’s about the enterprise. “So, what’s happening, what do we need to be thinking about?” This social revolution has created a social divide. 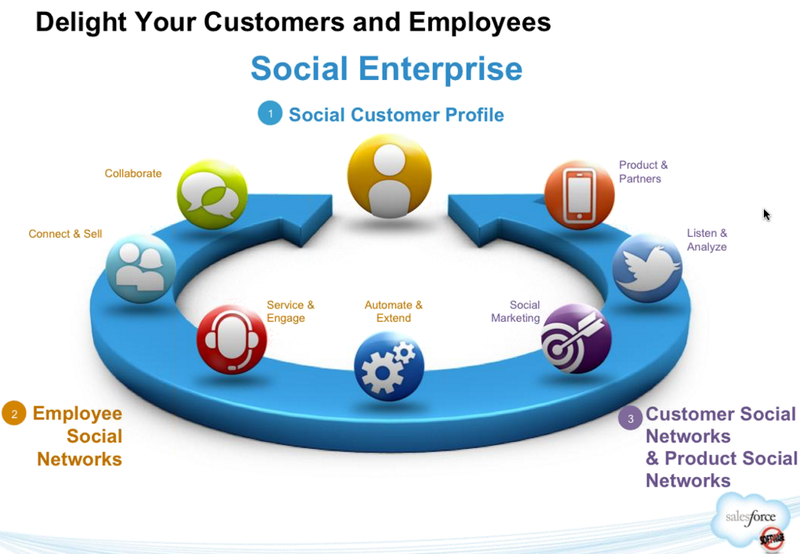 Your customers are social and employees are social. But are our companies? Our are enterprises social? This has really been on my mind since we last met.” It doesn’t matter if you’re in Japan, Russia, or the United States. 9:36 – We want to help organizations bridge that social divide. I’ve traveled more in the last six months than the last six years. This transformation is so important we need to find a new answer. “Think about this:” We’ve been looking for best practices, modeling the success stories, finding the companies breaking through and ask them when they are doing. 9:37 – We’ve come up with a 3 step process. First it’s about the database. You can learn more about your customers than ever before on the network. Step 2, we want to create an employee social network. We’ve been talking about that for several years now. We launched Chatter last year. We’ve learned from you that we need more than that, we need collaboration. It’s not just about another island of collaboration, or island of data, it’s about integrating all your business processes and workflow and applications into that employee social network. Including the sales force, the customer service organization, and including custom applications. 9:40 – We have to step up. Want to excite you, inspire, and look into the social enterprise and take you through the door, a door we’ve locked ourselves. Now he’s talking about Salesforce and the cloud. 9:41 – Your project is portable, your data is portable. Everyone can participate. 9:44 – Discussing their social enterprise research from around the world. Says that their vision of the social enterprise “is inspired by you.” Telling the story about using social networks, travel, and their organization. How in his recent trip to Boston, they talked extensively on their network about their plans, yet the hotel knew nothing about what they discussed. “Delighting customers means knowing who they are and what they like.” Getting that customer database so that they have a great experience when they use your products. 9:46 – We have to get back to our data models, back to the core. Introducing Dan Darcy, VP of product development. Showing a contact record in Salesforce. 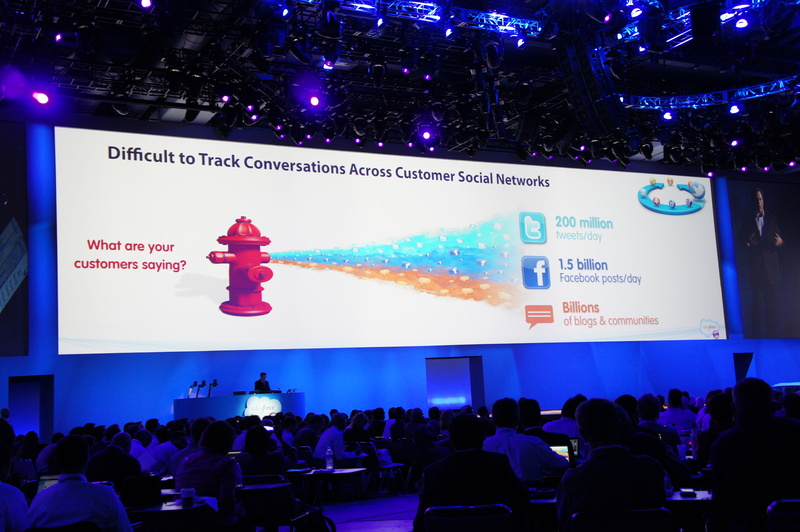 “Your contacts, they’ve gone social.” The new social customer profile builds an entire picture. Name, picture, where they are geolocated, what apps they use, what deals they are involved in, what customer service issues they have. A deeply integrated view. 9:47 – Says social contacts is really exciting, the crowd claps. Talks about giving everyone the tools to really “delight their customers.” Takes everything from Facebook, Twitter, and public information and streams it into Salesforce. As of today, everyone can go into Database.com, with APIs, OAuth, and start working with this information. 9:50 – You can choose where your data is. It doesn’t have to be in our datacenter, it can be in your data center with the new data residency option (DRO) for those that store sensitive data and it is compliant with many corporate and government policies. Now you have the ability to keep it where you want. Note: This has been a major sticking point for many companies. 9:56 – Dan claims Chatter has become the leader in employee social networking. “We’re excited to make a series of new announcements” (so far everything that’s in Larry Dignan’s post.) 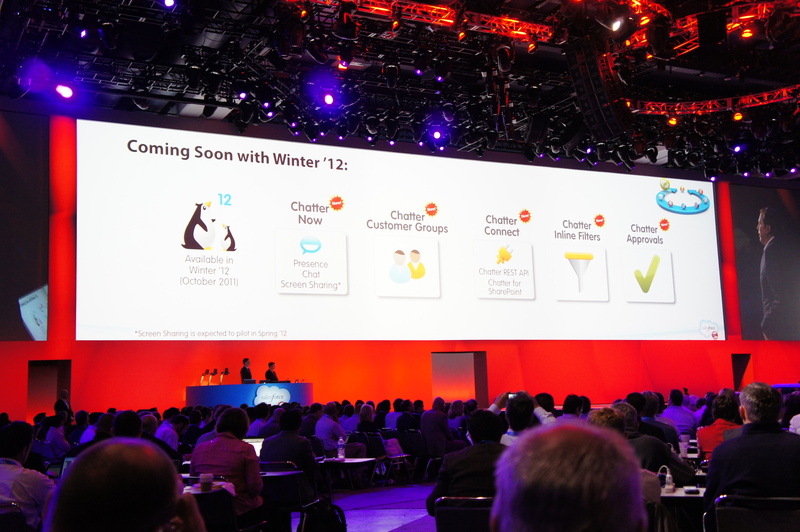 Including Chatter Now, screen sharing for collaboration. We’ve learned that the key to success with social collaboration is integrating social into workflow. Collaboration is not an island. (Note: Great stuff that’s spot on with current Enterprise 2.0 effectiveness discussions.) There is even Chatter for SharePoint. 10:00 – The Chatter activity stream shows what’s going on in the entire company, “it’s never overwhelming, can be drilled into, filtered.” You don’t have to spam the whole company with questions. You can post something and “the answer finds you.” This is crowdsourcing. Chatter for your entire company means you don’t have to fumble around and find the right system. Including ambient IM, hyperlinks, file sharing is part of Chatter, a killer app we think. 10:02 – We have an amazing social collaboration happening inside our company. “Wouldn’t it be great if we could bring our customers into this process.” Can create customer groups, “user empowerment”. Looks like normal Chatter groups. Shows a group with 12 employees and 3 customers. Says it’s happening today, just with legacy technologies to share proposals, marketing, working on RFPs. It differentiates you as a business to connect with them this way. Customers don’t have access to private and secure company info, just what’s in the group. 10:06 – Now going back to Marc. “Now customers can be part of your Chatter network.” They are firewalled off from all your other information. Just introduced Neil Young and is talking about how he’s using Chatter to collaboration and produce his next film. Also using it on their new Hires for the Masses product and more. 10:10 – “Now we’ve been talking about collaboration. But there’s another key part of building your employee social network.” Has been traveling around and getting inspired by his companies. Talking about Groupon visit and seeing the energy level, growing at 22,000%. The way they achieved it by hiring as fast as possible 5,000 sales people. The level of communication and collaboration, planning, logistics is amazing. $750 million in revenue, constant collaboration and building custom apps to support new capabilities. 10:12 – Talking about 150 new features. The big ones are social contacts and social sales. Now they are announcing Data.com, access leading providers of data including Dun and Bradstreet to connect it into the CRM process. 10:15 – Benioff is discussion how HTML 5 is going to revolutionize the mobile user experience. Pinching devices to access fields. They are announcing touch.salesforce.com. All these apps are going to run natively on HTML 5, including all the apps customers have already built are going to be brought forward. Note: I think this is a very smart move to improve user experience on Salesforce. 10:17 – Kraig is back and talking about Salesforce sales features. “Under every deal is Chatter.” Includes support for pricing approvals, sales strategy, mapping out the organization and influencers and decision makers. 10:18 – “Of course, everything is now mobile. This is what you’ve been asking for.” Showing a demo of the new touch site. Looks like a native iPad experience, but is not, all HTML 5. Showing how well the user experience works on touch-based tablets and smart devices. Everything apparently runs in this new interface with little to no rework. 10:20 – Now looking at social customer profiles. “What if I don’t have the information about the customer yet?” Shows how new Data.com services might have what you need. One-click integration of external social information from their partnership with Dun and Bradstreet. Then you can see who they are and what they’re talking about in external social networks. Salesforce clearly understands big data, social media, and the strategic value of data use. 10:22 – Talking about bring the customer into social meetings in Chatter to collaborate and discuss. One final new aspect, everything is integrated in real-time including mobile, so messages are immediate everywhere. Get an immediate Chatter notice “that someone has exceeded their sales quota” right when the order is booked. 10:25 – Marc introduces the president of Verizon Business, Bob Toohey, to talk about shaping the social enterprise. “Need the flexibility to create the B2B to C in a very simplified way.” Benioff asks him how their customers are becoming social. “They want to know more about their customers. They want identity management. Customers want to be able to say I want the flexibility to integrate everything and make it work.” Hints at predictive analytics. 10:27 – Now Marc is talking about the customer they are going to profile this morning, carefully selected so they can learn from it. It’s NBC Universal. Now showing video of talking about NBC Universal’s social enterprise experience. 10:30 – NBC Universal video concludes. Marc: “It was only a couple of years ago that we made a strategic decision to get involved into the customer service business.” Says it’s their fastest growing product line. 10:33 – It’s not just about banks. Now talking about airline KLM’s 130,000 Twitter followers, reduced first call resolution rate to 1 hour. KLM’s customer service is “deeply integrated into the social universe.” KLM has taken this “to a level I’ve never seen”. 10:37 – Marc asking if the CEO understands the need to become a social enterprise. Does the C-suite understand? Does the board understand? Do our employees understand? Announcing Chatter Service to enable customer service and taking “the Service Cloud even higher.” Community feeds, suggested knowledge, crowdsourced answers, agent escalation and much more. 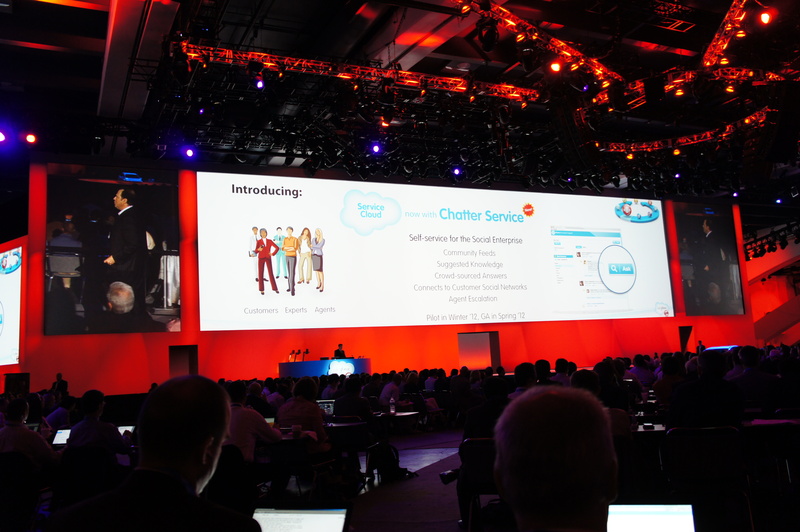 10:39 – Kraig is back out showing off Chatter Service in the Service Cloud. “It all started with Twitter. When Twitter started amassing users, everything was public.” Instead of contacting the company, customers just post, hoping that someone will help them in hundreds of millions of users. 10:40 – With the Service Cloud, customer service gets plugged into the social conversations. Showing a live demo of real-time streams of YouTube and other social media and route the issue right into the service center to resolve the problem proactively. Talking about taking all the “paradigms of the social world and plug it into your organization.” Exploring Cirrus computing story with an example of how it all works, including cross-posting resolutions back out to Facebook and Twitter. 10:43 – “Helps you service your customers in completely new ways.” Call center can’t be left behind. “Of course, we’re integrated into telephony”, including the social profile, right when they call in so the agent knows what they are doing and what their concerns are. The knowledge base will recommend the right answer and relay it to the customer via e-mail or telephone. But in a social world we can do something better. Can even do Facetime service to iOS devices. And he’s showing it live. 10:47 – Marc is back and talking about Avon, BMC, Kelly Services are running social apps on Force.com and others creating “breakthrough apps”. Very interesting: Now Facebook’s CIO Tim Campose is talking about how they use Chatter and “have been able to adopt it across the board”. 70% of Facebook’s internal apps run in the cloud and most of them use Force.com. 10:49 – Now Parker Harris is on video from the show floor talking about the exhibits and campground. Continuing to talk about Facetime integration. Invites those to come in and see how all the technologies discussed integrate together. 10:54 – Marc is talking about Step 3: creating a customer social network. “The customer social network has been a real eye-opener for me.” It started with their acquisition of Heroku. Has the Heroku team stand up. Says that it now runs Java, not just Ruby. Talking about Disney’s dynamic social communities. Games, vacation communities, photo sharing applications. ESPN, Best Buy, and Warner Brothers are all doing this and using Heroku technologies. Now with Heroku with Java and frictionless scale, availability immediately. Brings 6 million Java developers right into their social platform. 10:57 – Talking more about social marketing. Now having MC Hammer standing up in the front of the crowd. Now MC Hammer is actually saying pretty good sound bites about how the wall is coming down in enterprises. Social universes can be used to see if products “really resonate.” Relating his experiences with crowdsourcing ideas in the music industry, and using betas to strategically validate ideas with customers. What’s working, not working, and making changes dynamically based on social feedback loops. 10:59 – Marc is now bringing up the great (but now fairly old) story about Gatorade’s social media network operation center. Video is playing about their story. 11:01 – Here’s the exciting part of the confab for me: Discussing the Radian6 acquisition, social media analytics, and how it turns into social business intelligence. Half of the Fortune 100 uses Radian6 to analyze social media. “The beginning of the marketing cloud”. Demonstrating Heroku and Radian6 with a Disneyland app. Companies are creating social experiences and doing it on Facebook to create phenomenal customer experiences. 11:08 – Still demoing social customer experiences. “The next generation of listening and engagement. Marc is back up. “Most exciting part of the keynote. Going to talk about an incredible new capability.” A new product called “Product Social Networks”, will affect every company in the world. 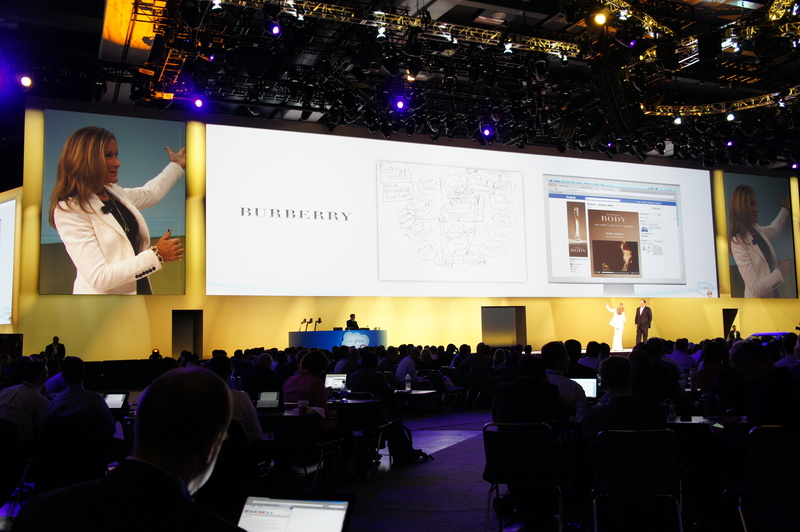 Showing a video about the Burberry CEO Angela Ahrendts about how to create a “consistent feel for customers regardless of how they were accessing the brand.” For any CEO that is skeptical, she says “You have to [do this]. You have to have a social enterprise. Otherwise I don’t know what your business model is in five years. 11:12 – Now Angela — who is actually here — is up talking about the borderless enterprise is the future. Talking about the Burberry Community vision. They want to bring together their “great customers”, suppliers, partners, into a social enterprise. “What is the next step?”, asks Benioff. “How do you plug all of this back into the existing infrastructure?” says Angela. 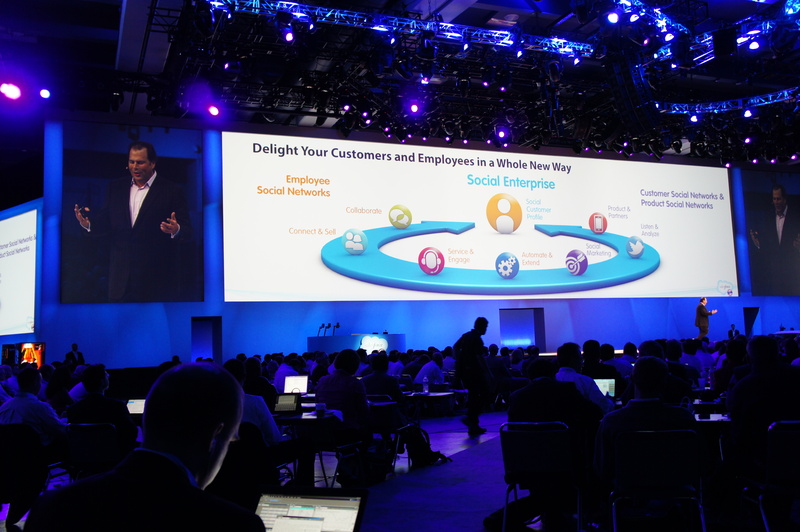 None of that goes away, Salesforce is an addition to plug it all into to optimize the social enterprise. As a global luxury brand, and the brand is the #1 asset, is what they’re selling before they sell anything else. The opportunity to take Chatter and brand it completely as Burberry is the key for them. 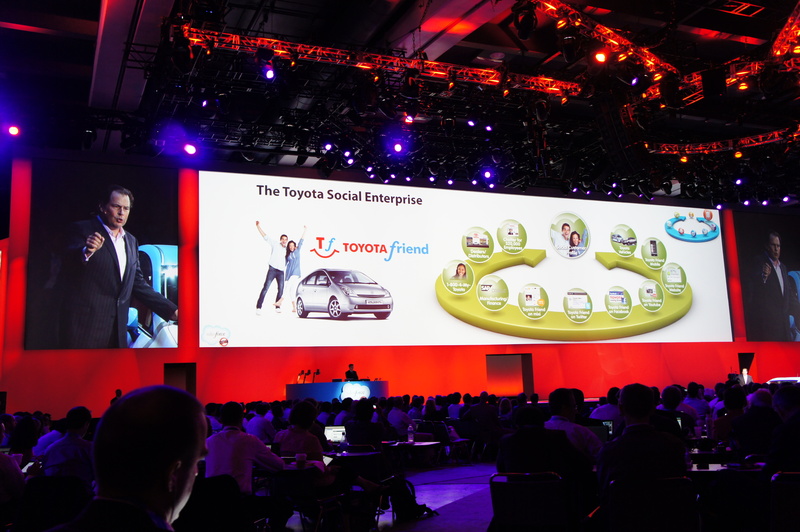 11:19 – Marc is talking about Toyota and the social enterprise. Relating the story about Toyota Friend, and how they are using that as the first part of their transition to the social enterprise. Connecting dealerships, customers, distributors, support centers, and even vehicles together socially. “Get your cars running on these social networks.” Now they are going to show Toyota Friends actually working so the user can see the charge level, maintenance cycle, tire pressure, interior temperature, etc. All information streams to you in a chatter feed (great stuff showing how devices and sensors can be social as well.) Connects to the whole family of cars and can be extended out to Facebook, Twitter, and so on. 11:24 – Continuing the Toyota Friends demo. Not just for customers, dealers, but also internal employees of Toyota. Marc’s back up, saying “this is happening to companies all over the world.” Discussing Enterasys and how they redesigned their products to be social. “Their switches are social.” Users receive real-time alerts. 11:27 – Bringing up the CTO of Coca Cola, Alan Boehme, and talking about the vision for Coca-Cola and the social enterprise. Where have you said “wow, this has really opened up for me.” Over 700,000 partners and colleagues around the world. Their big challenges: Who’s know who, who knows what, and who know who that knows what.” Technologies that bring people together creates major opportunities. 11:29 – Marc is taking about a new social enterprise license agreement so that per-user pricing delivers every product for every employee. Alan inspired them to create the new social enterprise licensing agreement. 11:31 – Wrapping up now, talking about transforming and “igniting” organizations around employee social networks, customer social networks, and product social networks. Eric Schmidt, Vivek Kundra, and Metallica are all coming up today and tomorrow. Summary: Overall an impressive amount of messaging and pretty spot on for the most part. We definitely get a better sense of where their social strategy is going as well as the larger outlines of how they’ll be going to market with this. Frankly, I’d be worried if I were a lot of social software vendors, because of the deep cross-product integration, opening of the platform, and the sheer number of key, strategic features now operational for true social business. 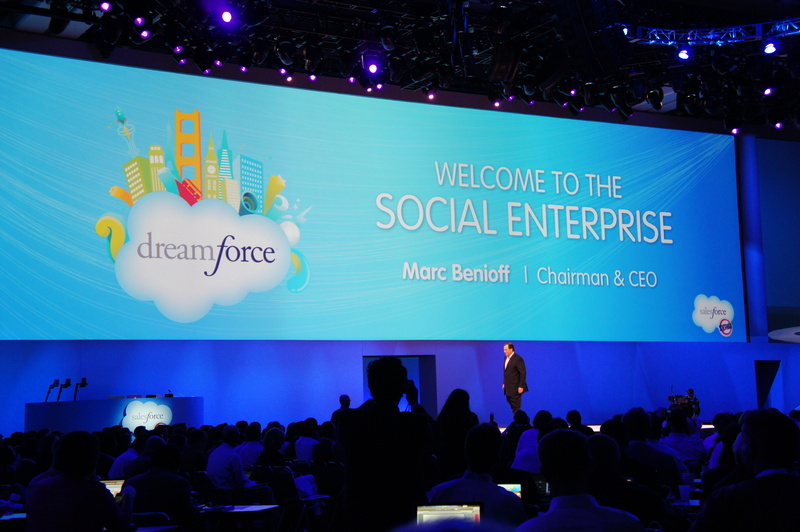 If I were a CIO considering the social enterprise, I’d now be including Salesforce in my short list. I’ll be analyzing this more on ZDNet, the Dachis Group Collaboratory, and elsewhere soon. This post has been cross-posted from Dion Hinchcliffe’s On Web Strategy.